Robina Floors is the North and South American Sales and Marketing Headquarter for the China-based Robina Wood, Ltd. located in Kennesaw, Georgia, close to the flooring hub of Dalton. Robina Floors is a young enterprise, lead by an experienced President and a team of seasoned hard surface flooring managers. The company has successfully built an extensive distribution network in the U.S. that is now covering most of the country. Robina Floors distributes both engineered wood and laminate flooring that is manufactured in several factories in China. Research centers develop and improve the products on an on-going basis and stringent QC procedures ensure consistantly high quality. 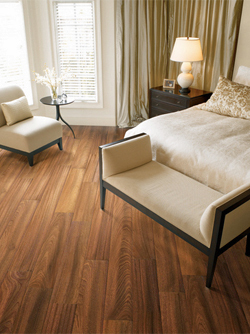 The wood collection contains products that range from the classic to the exotic in different thicknesses and widths. Market research and our customers’ feedback tells us that we are right on target in our color and wood specie selection. The laminate line is unique in that it consists of single plank looks only. Surfaces range from super smooth high-gloss, to light texture, to handscraped and embossed visuals. What differentiates Robina products from the industry at large is the patented locking system - our VR-Loc. The system is licensed from Vaelinge Innovation AB, one of the two market leaders in locking systems. This lock saves the installer up to 60% time and allows the do-it-yourselfer to enhance her home without frustration while saving a significant amount of money. Our products are also environmentally friendly. Please see our “Think Green” section for more information. The employees and management of Robina Floors are looking forward to serving our customers now and in the future. We listen to you to make sure that we have the flooring you need and want. We will also further develop our products to be able to give you a look and durability that exceeds your expectations.